Spain Eurocup 16 — Airzone with Spain in the Eurocup 16. Happy St. Valentine's Day — Happy St. Valentine's Day! Why not? 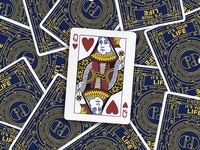 — DaOrtiz Playing Cards' Joker Animation Why not? Space — Space animation for a Web project. Coming soon! Energy Efficiency & Savings — House animation for a motion graphic project about air conditioning. Present — What do you think is inside?